Automechanika Frankfurt is in full swing and Schaeffler has an interesting booth this year. You might not recognize the name but they are the very proud manufacturing company of names you do know like LuK, INA and FAG. Their stand looks into the 'garage of tomorrow'. Showing the upcoming technologies that repair facilities will be able to access in the near future. Much like Schaeffler's motto, "Get more - be part of it", the 1,000 square meter booth encourages people attending to not just be spectators but to get involved. Michael Söding, the CEO of Automotive Aftermarket, Schaeffler AG said, "We want visitors to our trade fair stand to not only be spectators. They should also become part of our product world and experience up close the 'more' that we deliver." Attendees lucky enough for the ability to visit the booth and become part of the products will experience a fusion between the everyday mechanic shop and what looks like a futuristic high-tech operating room. 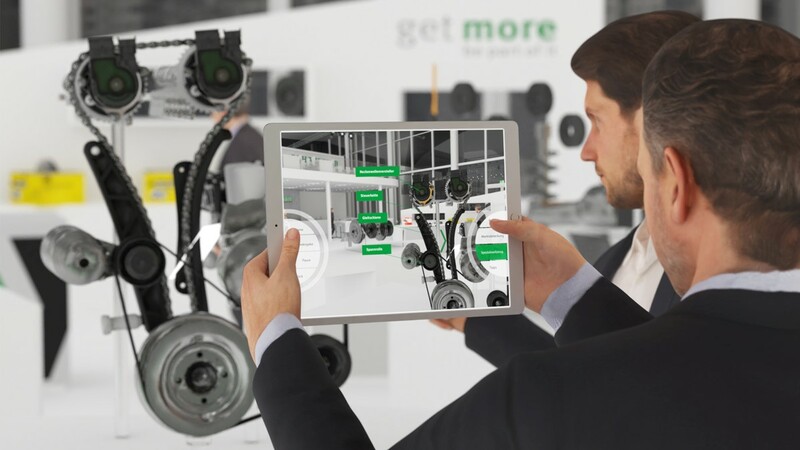 Utilizing a tablet facing at three augmented reality displays(transmission, engine and chassis), the user will be able to access virtual information about the repair, including intelligent repair solutions and special tools from Schaeffler needed to successfully complete the repair. Think of it like scanning your own car with the front facing camera of your tablet. You click the screen to focus on the wheel bearing hub and along with your high quality wheel bearing from FAG, the software advises exactly what tools you need, and provides a step by step tutorial. It is like YouTube DIY but without the shaky camera that is too much talking over wind noise. On top of that, Schaeffler is showing their "REPXERT" technology. 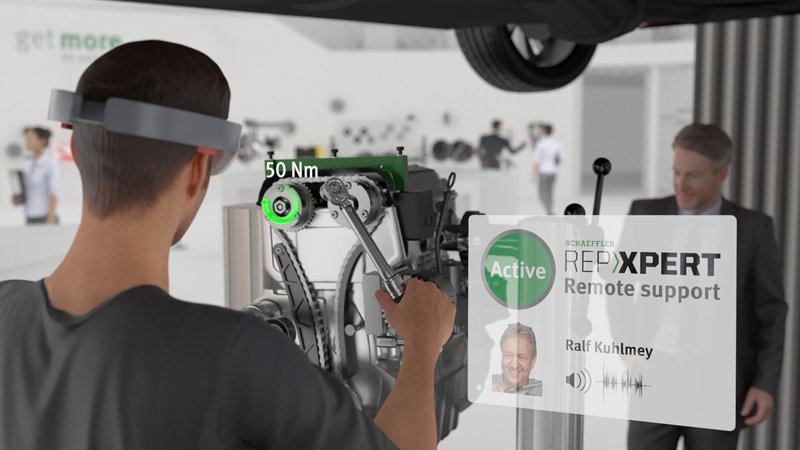 One way to utilize this service is 'smartglasses' where here the user is able to keep both hands working on the repair while the REPXERT support line helps work the technician through the problem. The technician also has access to service information, installation videos and technical brochures. To us it seems like one day not only will you need your trusty OBDII Ross-tech or whatever scanner you use but also smart-glasses to tap into instantaneous high quality support without stopping in the middle of the repair sandwiching your phone to your shoulder while praying your mechanic friend will pickup. On display by Schaeffler is the never to disappoint Audi RS5 DTM show car with 500 horsepower monster of an engine. They also have on display the Audi e-tron FE04 that is being driven in Formal E series. This first all electric racecar for Audi demonstrates Schaeffler has what it takes in producing products for even the toughest racing conditions. What technology holds for the weekend warrior of do it yourself, starts on the racetrack. Whether you are replacing your serpentine belt tensioner by INA on your Audi A4 B5 AEB engine or trying to figure out how to install a FAG wheel bearing kit for your MK1 Rabbit, we have always leaned on the experience of others to accurately accomplish the repair. Using what mobile devices we have at our disposal, are the high tech tools that we use today that will expand in places yet to be seen.